Movie critic Tom Charity predicts that "The Social Network" will win this year's Academy Award for best film. Critic sees battle brewing between "The Social Network" and "The King's Speech"
The countdown to Hollywood's biggest night is on. Join "Showbiz Tonight's" A.J. Hammer and Brooke Anderson for live red carpet access at the Oscars on "Road to Gold" Sunday at 7 p.m. ET on CNN. (CNN) -- The past, present and future of the movies is to be the official theme of Sunday's Academy Awards show, presided over by bright young things James Franco and Anne Hathaway. But that's also the unofficial subtext in what has the potential to play out as one of the most vivid generational tussles in Oscar's 83-year history. The ceremony received a much-needed ratings bump last year, when it drew 41.3 million viewers. The experiment of an expanded field of 10 best picture nominees got plenty of the credit, even though everyone knew it was essentially a two-horse race: the blockbuster ("Avatar") against the indie (eventual winner "The Hurt Locker"). This year, all the signs point to another tight call between two front-runners. Between them, "The Social Network" and "The King's Speech" have carved up almost all the various annual honors that serve as harbingers for Oscar. 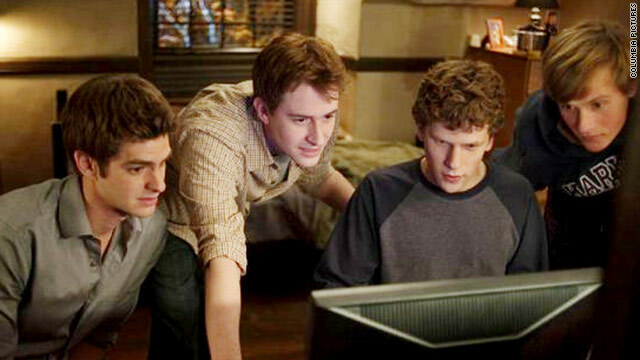 "The Social Network" raked in the lions' share of the critics' awards and the Golden Globe for best drama and director. But "The King's Speech" netted more Oscar nominations (12 of them to 8 for the Facebook movie) and triumphed at the British Academy Awards, the Baftas. In terms of box office, there's not much to choose between them, though "The King's Speech" has edged over the $100 million mark this week. Still, the British movie is judged the front-runner by most pundits, partly because of the perceived campaigning zeal of Harvey Weinstein, its U.S. distributor, and partly because "The King's Speech" seems a more respectable choice for the Academy. British films often punch above their weight, and playing royalty never hurt an actor (playing the Swan Queen hasn't hurt Natalie Portman either). But the real gap between the two favorites comes down to age. A costume drama set in the run up to WWII, "The King's Speech" appeals primarily to those over 30 (Geoffrey Rush turns 60 this year, Colin Firth is 50, Helena Bonham Carter will be 45 in May) while "The Social Network" is all about how 20-somethings have revolutionized the 21st century (Jesse Eisenberg and Andrew Garfield are 27, Armie Hammer is 24, Justin Timberlake just turned 30. Mark Zuckerberg is 26). And the average age of the members of the American Academy of Motion Pictures and Sciences -- 57. So is it a done deal? Only if you believe that Academy voters are fogeys and technophobes. It's true that Screen Actors Guild members didn't show commensurate love to "The Social Network" when it came to picking the acting nominees, and I'd be as astonished as anyone if Jesse Eisenberg beats hot favorite Colin Firth to the best actor prize. But most 50-somethings I know are quite conversant with the internet, and might well relate to screenwriter Aaron Sorkin's rather beady view of Mark Zuckerberg's start-up upstarts. We'll see similar generational conflicts played out again and again on Sunday. In the best actress category, voters will choose between the establishment favorite, Mrs. Warren Beatty (Annette Bening), and 29-year-old Natalie Portman. In the supporting categories, veterans Melissa Leo and Helena Bonham Carter are up against Amy Adams and 14-year-old Hailee Steinfeld. And I expect the youth market's favorite blockbuster, "Inception," to come away with four or more of the technical and craft prizes. The big loser in all this is likely to be the Coen brothers' western "True Grit," my own favorite among the nominees, despite its impressive haul of 10 nominations. Then again, the pundits have got it wrong before -- remember "Crash"? The truth is, until the Academy starts publishing the breakdown of the votes (highly unlikely), we're all working on rationalization, gossip and gut feelings. For what they're worth, here are my own predictions in the major categories. "Outside the Law (Hors la loi)"